Multimedia processing demands efficient programming in order to optimize functionality. Data, image, audio, and video processing, some or all of which are present in all electronic devices today, are complex programming environments. Optimized algorithms (step-by-step directions) are difficult to create but can make all the difference when developing a new application. This book discusses the most current algorithms available that will maximize your programming keeping in mind the memory and real-time constraints of the architecture with which you are working. 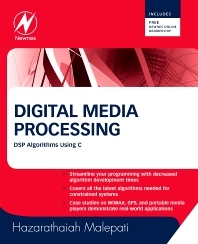 A wide range of algorithms is covered detailing basic and advanced multimedia implementations, along with, cryptography, compression, and data error correction. The general implementation concepts can be integrated into many architectures that you find yourself working with on a specific project. Analog Devices' BlackFin technology is used for examples throughout the book.